Do you want to free yourself from the stress of creating employee work schedule? If yes, then employee scheduling software can be of great help to you and your business. Employee scheduling software helps you to plan employee across time slots and locations. It can easily manage shifts, time off, payroll, schedules, and more, which will save a lot of your time. There is plenty of employee scheduling software in the market provided by different providers. All of them have their own distinct features. Here you will get a list of 10 best employee scheduling software along with their features, to help you choose the best one for you. 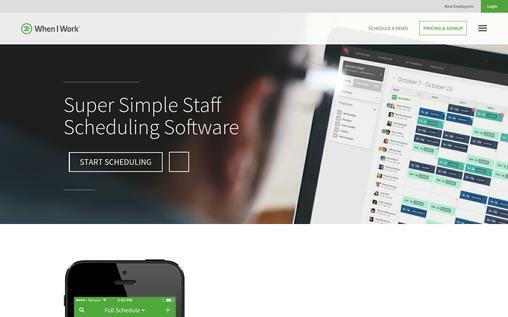 appointy is an amazing employee scheduling software with plenty of exclusive features. Some of its clients are Mashable, WordPress, The New York Times, and more. 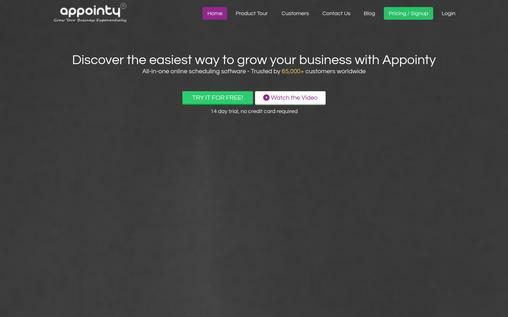 appointy provides complete control over your schedule. You can open activity time slots whenever you want, and then you can specify the capacity and duration of the activity. It also offers a mobile admin console, which allows you to manage your staffs from anywhere. It includes powerful business analytics to let you see the detailed overview of your staff’s activities, customer satisfaction, and more. It helps you to manage your resources effectively by letting you open time slots only when previous time slots are filled. 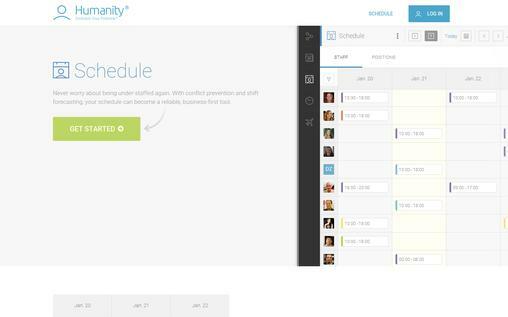 appointy lets you add staffs and managers, and they themselves can also manage their own schedules. They can have their personal google calendar. You can enable booking rules for allocating services to most free resources. The multi-support location support of appointy lets you control your staffs and business in different locations from a single location. You have four plans to choose from, and they are a free plan, pro plan, business plan, and enterprise plan. Pro Plan costs $29.99/month to get started. ZOHO offers an easy employee scheduling software to effectively manage your staffs. It just takes one click to record all your tasks with ZOHO. The timesheet in ZOHO lets you determine the exact capacity of your employees’ work time accurately. You are also allowed to record the job entries as per your requirement, which could either be daily or weekly. ZOHO lets you set simple structure based upon a hierarchy for easy flow of approval, based on roles and designation. The report section of ZOHO will provide you accurate reports about the time you’ve spent on the specific job, the employee’s performance, work progress, and more. The centralized database of ZOHO allows you to accurately maintain your employees and their records according to their designation and department. You can provide authority to your employees to update their information like address, marital status, and others. Your HR will get notified about the changes. ZOHO Mobile Apps allows you to stay connected with your employees and manage them anytime anywhere. 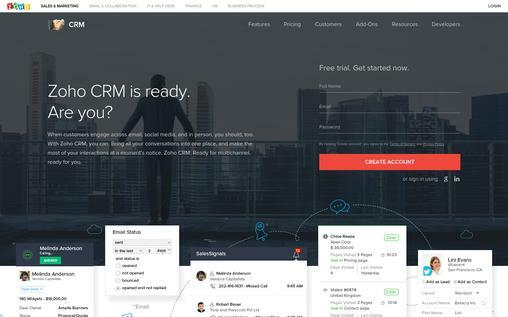 You can start with ZOHO for free, or you can choose from other paid packages. The starting paid package starts from $19/month. WhenIWork allows you to manage your employees from anywhere according to your convenience. You can either manage your employees online or through your mobile apps. The easy interface of this software allows you to add and invite employees in a matter of minutes. You can also import the list of employees through CSV files. You can quickly and easily fill shifts in seconds. You just need to click the shift and locate the most qualified employees to fill the shift. Your employees will get a notification or mobile alert. The communication with your staffs gets easier with WhenIWork due to its one-click custom texting and group email service. You can let your employees to schedule their shifts. You can switch between the locations and manage the employees of different locations from a single platform. The package starts from $29/month, and it also offers 30 days free trial. 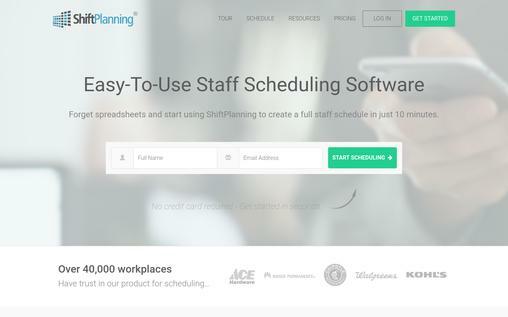 ShiftPlanning offers employee scheduling software, which is suitable for the business of each and every size. It is very easy to get started with ShiftPlanning. You simply need to add employees, provide basic info, and start scheduling right away. You just need to plan the shift and hit publish to send recent schedule to your staffs. The simple interface provides a detailed overview of the schedule to let you develop conflict-free schedules. You can set specific time clock locations and know the exact clock in/out time of your employees. You can view the shifts of your employees in multiple ways like weekly, daily, and monthly in either graphics, visual, or list formats. The SMS alert and email notification to employees eliminate chances of forgetting shifts. You can easily collect, store, and access all important HR documents from a single platform. It can easily be used to train new employees or manage existing employees. The starting package costs $45/month. 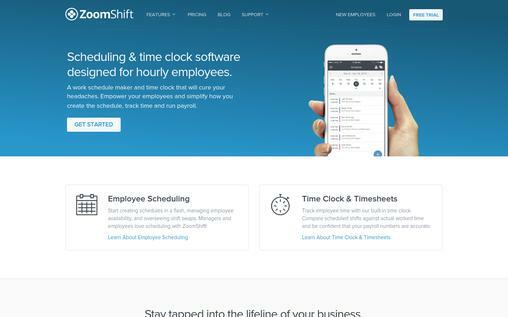 ZoomShift is a feature-rich employee scheduling software. You can develop a perfect schedule without conflicts with the help of ZoofShift. You can view the shifts in daily, weekly, or monthly basis, and filter the schedule in many different ways. It offers real-time budgeting, which means the wages are automatically calculated as you go about building a schedule. You don’t have to waste your time to build a schedule. You can develop lists of schedule template library, and apply it with a single click. The communication with your employees is easily managed with mobile notifications sent to your employees for the schedule, and shift reminders. You can easily track your employee’s availability by managing your employee’s time off request and recurring availability. Your employees can swap shift themselves easily with a group of other employees, and it is up to the manager to approve the request. ZoomShift offers 3 packages, and they are Lite, Plus, and Premium Package. You get Lite Package at $1.5/employee per month. WhenToWork is an affordable and dynamic employee scheduling software. The simple interface allows you to easily create, view, change, and track schedules. You can either create repeated or varied employee schedule with this software. Your employees can view the published schedules to know about the timings. It is easier to create a schedule. You can quickly add shifts, or you can copy from previous week template or other online templates. You can let your employees choose the shift for themselves. You can view the employees of multiple locations or departments either together or separately. You can track changes made to the schedule, check for conflicts, export schedule data, and more to take control over your employees. WhenToWork allows you to manage your employees from either desktop or smartphone. 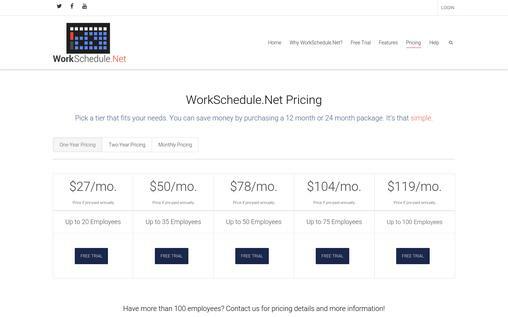 The starting price of WhenToWork package is $15/month. 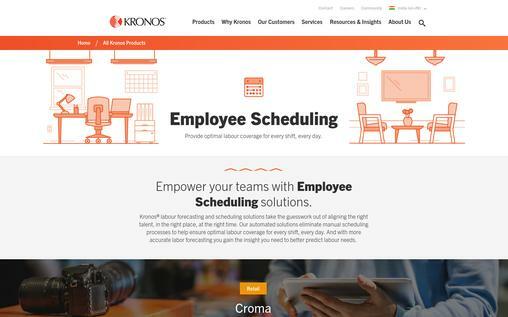 KRONOS offers exclusive features, making it a really good employee scheduling software. It offers cost effective solutions to the employers to increase their employee’s productivity. It automatically optimizes scheduling to reduce costly errors. The sophisticated optimization algorithm in KRONOS lets you develop the best fit schedule to remove understaffing and overstaffing issues. You can let your employees swap shifts, select shift preferences, view schedules, and more. The employer can create a schedule complying with country-specific legislation and employee contracts. The minimum and maximum working time and extended working time can be defined by the employer. You have a visual indicator in this software to show you a detailed overview of employees in different departments to help you identify under-covered departments for optimally managing your resources. 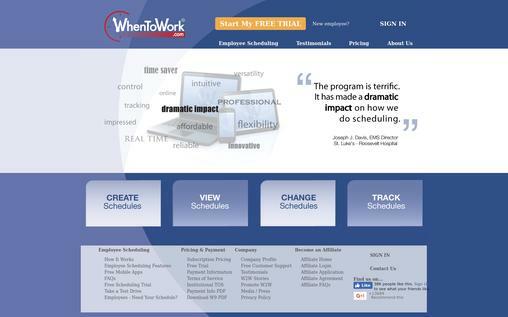 WorkSchedule.Net includes all the versatile features to schedule your employees effectively. It automatically selects the best employee to a specific shift. The templates provided by the software and recurring schedule templates save your time, and let you define the default schedule. You can also check your schedule and manage it anywhere with the mobile app provided by WorkSchedule.Net. Your employees can select preferable shifts and declare their availability online. The time tracking tool allows your employees to clock in or out, and you can know if your employees are available or not. Your employees can request time offs online, and the manager can instantly approve or decline the request. The schedule change alert and reminder let your employees be up to date with their current shifts. Your employees are allowed to swap shifts with other employees within your guidelines. The starting package costs $27 /month if prepaid annually. Snap Schedule is an easy-to-use employee scheduling software, which is suitable for businesses of different sizes. Snap Schedule lets you manage unlimited shifts, locations, and employees. It allows you to auto-generate shift schedules, and view shifts in multiple views. You can create shifts in no time, which allows you to reduce scheduling and admin time. You can manage the schedule through any devices from anywhere. The comparison between scheduled shifts and actual work time can be viewed in the Snap Schedule platform. This software automatically computes labour costs, tracks over time, and more. You can instantly access employee information, skills, and more. This software lets you comply with labour rules, minimum rest time, and break while creating schedules. You can set the level of autonomy to be provided to your employees. It offers extensive reporting capabilities, providing you more than 30 different types of reports for detailed analysis. The starting package price starts from $450/year. Humanity offers reliable and simple software to schedule the shifts of your employees. You can collaborate with your employees and create perfect shifts. Your employees can trade shifts with other employees, providing them flexibility and reducing the work of managers at the same time. Your staffs are automatically notified via SMS and email about the new schedule, or if there are any changes in the shift. The drag and drop feature in Humanity lets you create schedule easily, and it also has auto-scheduling capabilities for automating your staff’s shifts. The conflict resolution setting automatically detects errors to avoid conflicting timetables. You are provided with 24/7 support to solve your problems. You can import CSV files, and Humanity converts them into beautifully presented schedules. 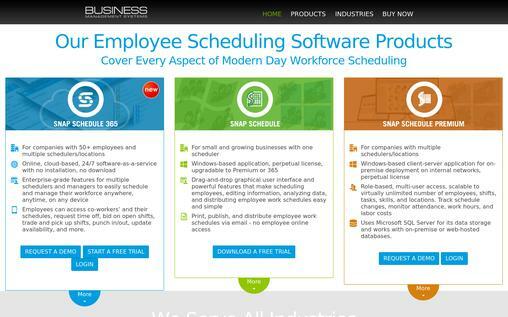 These are some of the best employee scheduling software available in the market. If you’re still performing an employee scheduling function manually, then you must have changed your mind now. Aren’t the features offered by the employee scheduling software really amazing? These features will help you to manage employee scheduling function in a very quick time, and you can allocate your precious time to other productive works. Very good list. Lots of options. Seems everyone has their own favorite software tools.They’re really helpful and I found some exactly for me!